We brought this class back by student request even though the 4/5 year cycle hasn’t passed since we did it last. The class has two parts, over two Torah-Tuesdays, this year on March 25th and April 1st. Here’s the 2014 Schedule of Passover Seders, Holiday Meals and Prayers at Shabbos House. Click here for the 2015 Passover Schedule at Shabbos House. Below is the full, updated Shabbaton schedule. Scroll down to see detailed info. The Regional Chabad on Campus Shabbaton is just around the corner now… Friday evening March 7th though Sunday morning March 9th, with a special Sat Night activity and un-filled Extravanganza 8pm-10:30pm on Sat March 8th. MMMM.. stands for Mini-Foods, Mini-Masquerade and Music. All this Sat Night 2/15/14 at Shabbos House. Shabbat with a Little Love! “Shabbat with a Little Love” is the theme for our February 14th Friday Night dinner at Shabbos House. Why only a little love? Northeast Regional Campus Chabad Shabbaton – in Albany! Save the date for the weekend of March 7-9 2014 for the Regional Chabad on Campus Upstate NY/Northeast Regional Shabbaton – to be hosted this year at Shabbos House UAlbany! 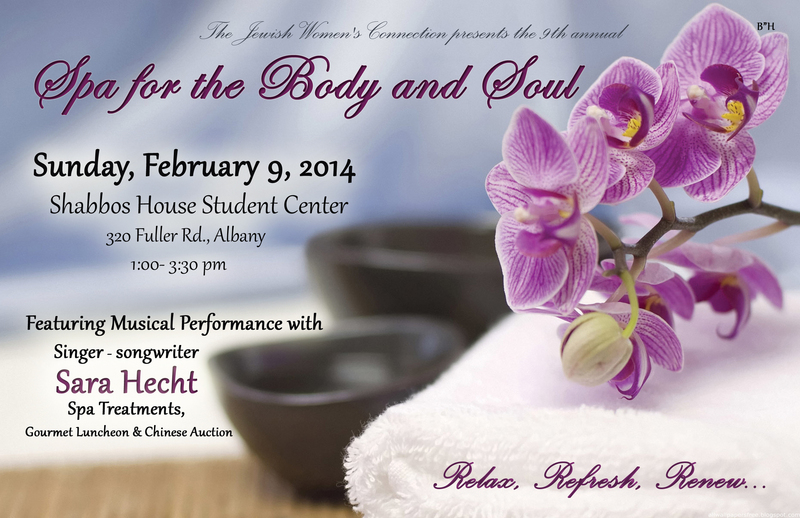 This year is the 9th annual Womens “Spa for the Body and Soul” co-sponsored in joint coordination by a number of area Jewish Womens groups.